I know what you’re thinking. Well, if this is your first time reading my blog, I have no idea what you’re thinking, but if you’re one of the two or three people who have been with me from the beginning, I think you’ve probably started wondering what ever happened to all those inner children of mine and those shrines I said I was making from Altoids tins. 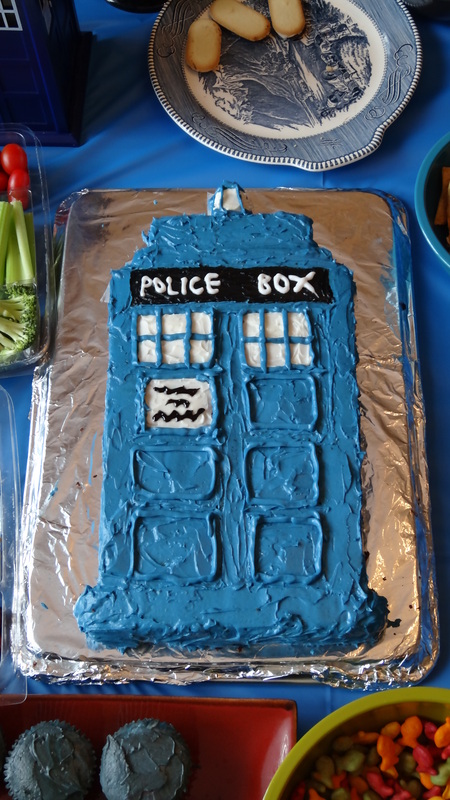 I made one for the youngest, Ruthie, and I said that I planned to make one for each of the others, but then I went off on various tangents and no other tins appeared. My faithful followers, I have finally made another shrine. This one is for the second-youngest, the one who is a Junior Girl Scout. In order to make a shrine for her, I had to figure out who she is and what she brings to the table. I remembered early on that she loves embroidery. She’s the one who is content to sit quietly in a corner of the couch and stitch for hours. It’s creative for her but it is also meditative. She’s excited about my current collection of embroidery floss and yarn. She can’t wait to get her hands on all those pretty colors. Stitchery is her creative expression but her essence is responsibility. If all my inner children and I get together in a sacred circle to make plans for personal transformation, she is the one who will be reining in the crazy ones and grounding the flaky ones. If they elect officers, she will be the parliamentarian. She knows Robert’s Rules of Order and she’s happy to keep everyone on track. She loves uniforms, she loves structure and she loves doing what’s right. She’s not just my inner child; she’s my inner Goody Two-Shoes. She is also a fire builder. I had forgotten that. On her first Girl Scout camping trip, the girls chose their jobs by pulling strips of paper from a jar. The one she pulled said “fire builder.” After that, she had experience, so she tended to get the fire building job at every camp-out. How could I forget that, deep inside me, there’s a careful, responsible person who can be trusted to build a fire and keep it burning safely and steadily as long as it’s needed for cooking and for warmth? It turns out that this one is not just a quiet, well-behaved needleworker. She is the keeper of my flame. The others may be crazy and spontaneous and wild but somebody has to make sure the center holds. She’s the one who holds it. She’s happy in her role and she knows her value. She’s the reason the others can feel free to wander and dance and fly. She will always make sure the beds get made, the bills get paid and the fire never goes out. A nice little campfire and plenty of embroidery. That should do it. 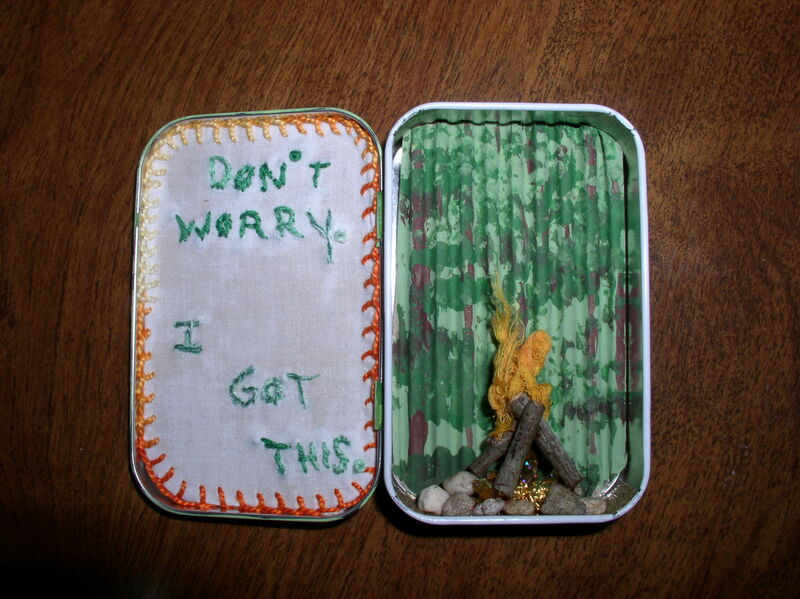 This entry was posted in Uncategorized and tagged Altoid Tin Shrines, creativity, Girl Scouts, inner children, Needlework, responsibility on September 29, 2013 by releaf1954. My older daughter has a way of talking me into doing things I end up enjoying even though I had initially been determined to avoid doing them. She talked me into going to the midnight release party for the last Harry Potter book. I am a morning person and I’m usually in bed by eight o’clock, so I was pretty sure I did not want to drive to a bookstore late at night, but she reminded me that it was the last book in the series and I would never have another chance. I gave that some thought and decided I wanted to see what a release party was like. I thought I would try to be the designated muggle and leave the Hogwarts attire to my daughter and grandson, but in the end, I couldn’t resist the chance to dress up. My sneaky daughter signed me up for the costume contest when I wasn’t looking. I won my age group, which was “adult.” I was not the only adult in costume, but the others were all a whole lot younger. I’m pretty sure the judges were honoring my nerve, but still…I won! She talked me into doing NaNoWriMo last year. That’s National Novel Writing Month, in which folks sign up to write a 50,000 word novel in the month of November. It was not easy to convince me to try this. She went to great lengths to pull it off. She not only won NaNoWriMo herself the previous year (winning means completing 50,000 words), she made it look easy and she made it look fun. I watched her having such a good time and I started thinking I might do it with her the next year. That was her whole plan. She knows I love to write and she also knows I could not imagine taking on a 50,000 word challenge in the month that includes Thanksgiving, when I bake eighteen pies and host a large family gathering. She lost nearly two weeks of her first National Novel Writing Month to various friendship crises and she still finished her 50,000 words early. 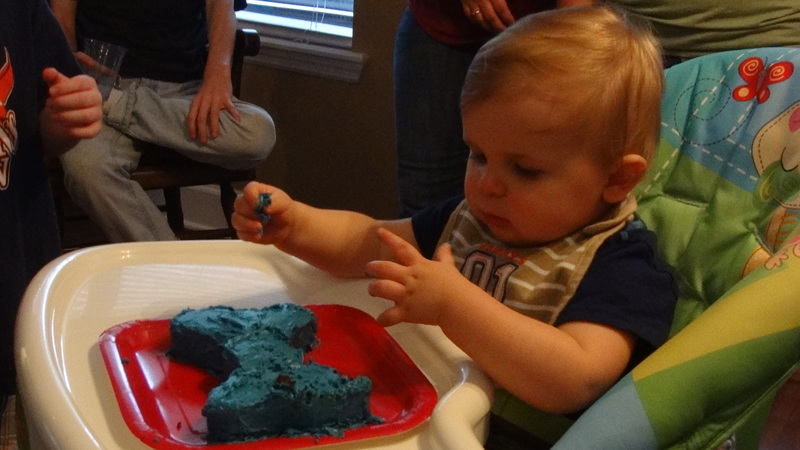 Having the entire month to do it (less pie-baking day and Thanksgiving, of course) should be a piece of cake, right? She made me believe it. It turned out to be neither a piece of cake nor as easy as pie, but I sure was happy with myself when I validated and got my winner’s certificate. 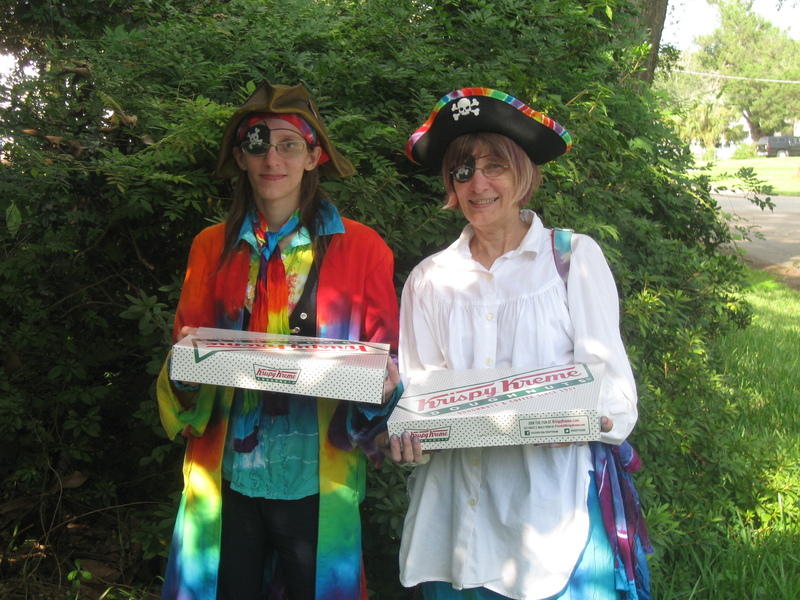 This entry was posted in Uncategorized and tagged dressing up, Harry Potter, Krispy Kreme, NaNoWriMo, Talk Like a Pirate Day on September 22, 2013 by releaf1954. I love my new watercolor pencils. I love them so much, I wore the points to useless little nubs. This was a problem because I did not have a decent pencil sharpener. I know, I know…how could a person with a room full of art supplies not have a decent pencil sharpener? Well, I bought a rotary sharpener a long time ago, but I never found a good place to attach it, so it’s still useless to me. I had plenty of cheap sharpeners, but I knew these would only tear up my pretty new pencils or over-sharpen them until the points broke off. I needed a good hand-held sharpener and, thanks to Samie Kira, I knew exactly which one I wanted. Samie blogs as Journal Girl and I remembered an entire blog post she had done about the best pencil sharpener in the world. 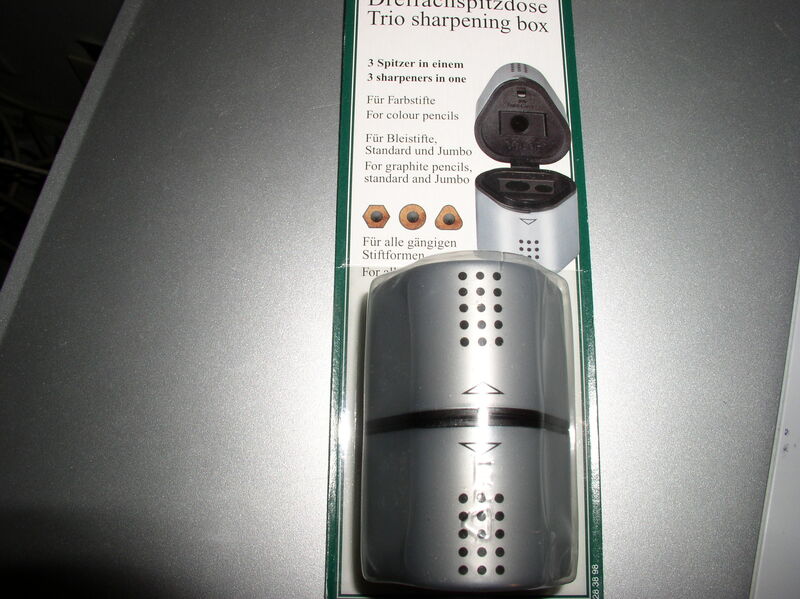 It was the Faber Castell 9000 and once I read about how wonderful it was, I couldn’t imagine buying any other sharpener. I decided to go on a quest. I clipped out some coupons and drove to a nearby shopping center that has a JoAnn at one end and a Michael’s at the other. I tried JoAnn first. No luck. I was still in JoAnn when I got a call from my daughter, who was wondering if I was planning a pencil sharpener hunt. She thought she might like to come along. Oops! I guess I should have called her before I left. I told her I was already on a pencil sharpener hunt and she sounded so disappointed, I offered to drive back and pick her up. We ended up agreeing that I would check Michael’s first and if they didn’t have the pencil sharpener, I would pick up my daughter and we would plan our next move together. Michael’s did not have the pencil sharpener, so I drove to my daughter’s house. When she came out of the house, we talked about where we should go next. She suggested Hobby Lobby, but I reminded her that it was Sunday and Hobby Lobby would be closed. That left A.C. Moore, which is a long way to our South and West, and the local art supply store, Reddi Arts, which is across the river. Jacksonville is a river city and plenty of folks cross the river every day just to get to their jobs, but my daughter knows I am not fond of crossing the river. Anything seems too far away if I have to cross the river to get to it. In this instance, though, a true art supply store seemed a better bet than a chain arts and crafts store, so we decided to make the river crossing. That’s when I learned that my five-year-old grandson was quite keen on coming along. Oh, and since we were crossing the river, could we maybe drop my daughter’s husband at a Magic: the Gathering tournament over there? This was turning into quite an adventure. By this time, it was nearly one o’clock and I usually have my second half-cup of coffee at noon. 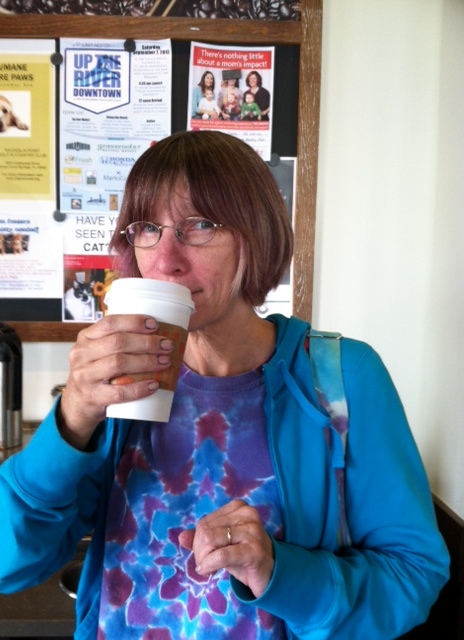 My daughter knows how cranky I get without my caffeine, so once everyone was buckled up and I said, “Where’s our first stop?”, she said, “Starbucks.” Since I had read in the paper (yes, I still read newspapers – I’m old) that Starbucks had recently started serving the Pumpkin Spice Latte again, I agreed. The first Pumpkin Spice Latte of the year is worth celebrating. Once we had our treats from Starbucks, we drove across the river and dropped my son-in-law at the game center. Then my daughter navigated while I drove to Reddi Arts. Reddi Arts is like Disneyland for creative people. It’s simply huge, with art and art supplies everywhere. There’s a gallery. There are watercolors and oil paints and pastels and acrylics. There is every kind of support imaginable, from paper to canvas to board. There are art supplies for children and art supplies for students and art supplies for professional artists. You name it; they have it. Except for the Faber Castell 9000 pencil sharpener. I had to settle for a different Faber Castell, one that had three sharpener heads instead of two. It was not the Holy Grail of pencil sharpeners, but it would have to do. I needed to be able to use my watercolor pencils. I had to re-sharpen the blue pencil a lot to finish this drawing. This entry was posted in Uncategorized and tagged art supplies, creativity, pencil sharpener, pumpkin spice latte on September 8, 2013 by releaf1954. This blog, by design, is not about the tie-dye business. Some day, we’re going to have a web site for the tie-dye business and I intend to have a blog there about the tie-dye business, but this blog is about creative pursuits other than making tie-dye. Still, the tie-dye business does sometimes lead us into other creative pursuits. Recently, it led us into Office Depot, where we were hoping to find a sign that would let folks know that we are now able to take credit cards. They did not have such a sign, but they did have something else: Prismacolor Watercolor pencils. On clearance. Perhaps a stronger person could have resisted those pencils, but I could not. In my overstuffed creative space were many kinds of art supplies, but no watercolor pencils. Watercolor crayons, yes; watercolor pencils, no. And they were ON CLEARANCE. I had to have them. My daughter (who is also my business partner) talked me into buying some for her, too. What can I say? They were on clearance. I thought I would take them right home and draw something with them, but it actually took me more than a week to get brave enough to try them out. 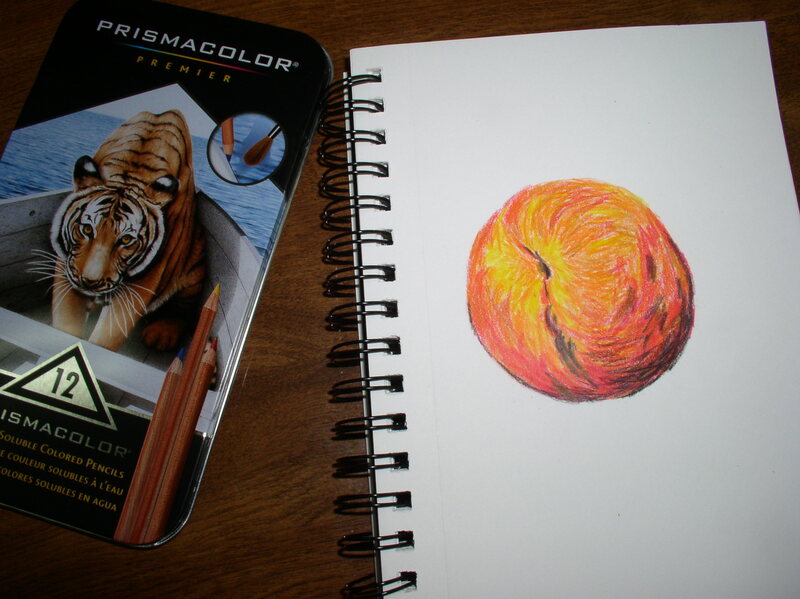 My husband had bought some peaches at the grocery store, and when I saw them sitting on the kitchen counter in all their red and gold glory, I decided it was time to brave the blank page and give those pencils a try. 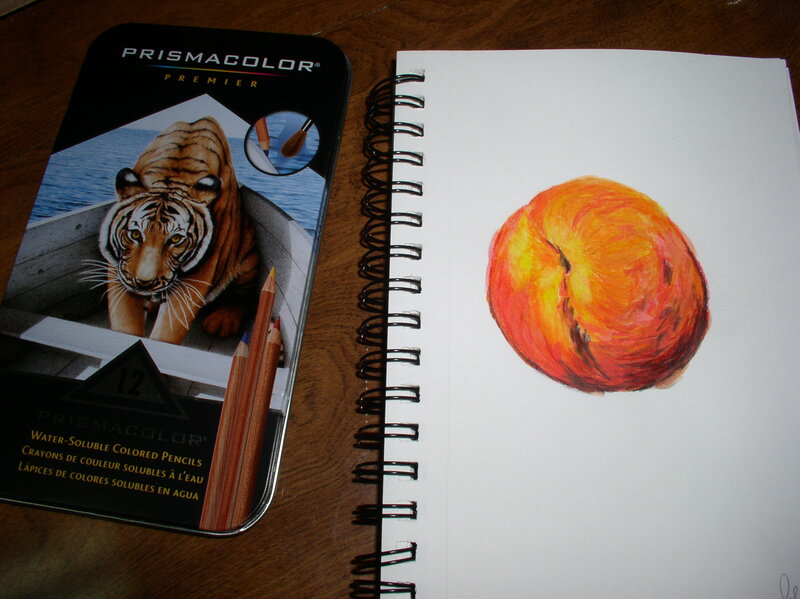 I chose one perfect peach and found my small sketchbook. Then I opened up my brand new pencils. They were already sharpened and utterly beautiful. Drawing with them felt comfortable and intuitive. There are only twelve of them, so deciding which one to use was uncomplicated. With that limited selection, there was usually only one that would even work for what I was trying to capture, so that was the one I grabbed. It was fun to try for different effects by layering colors on top of each other and I really liked the way my peach turned out. I decided to take a picture of it before adding any water. I am happy with this peach. Since I am never happy with any of my attempts at art, that’s saying quite a lot. I was happy enough when I finished it that I started looking around for something else I could draw with my watercolor pencils. 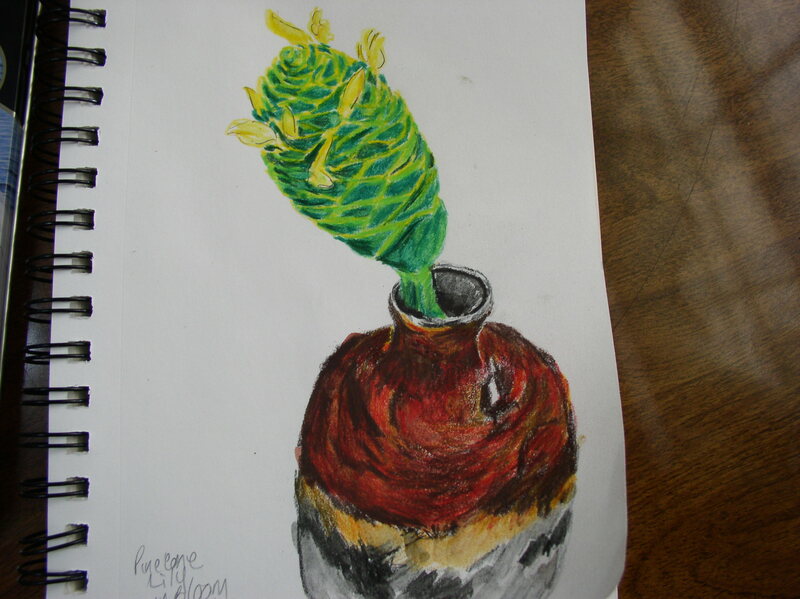 I found that my husband had cut a pine cone lily and put in in a handmade vase on the kitchen table. My left brain was worried again because it looked pretty complicated, but my right brain decided to go for it. I like it. I’ve done two colorful drawings in one week and I actually like both of them. Maybe there’s hope for me after all. 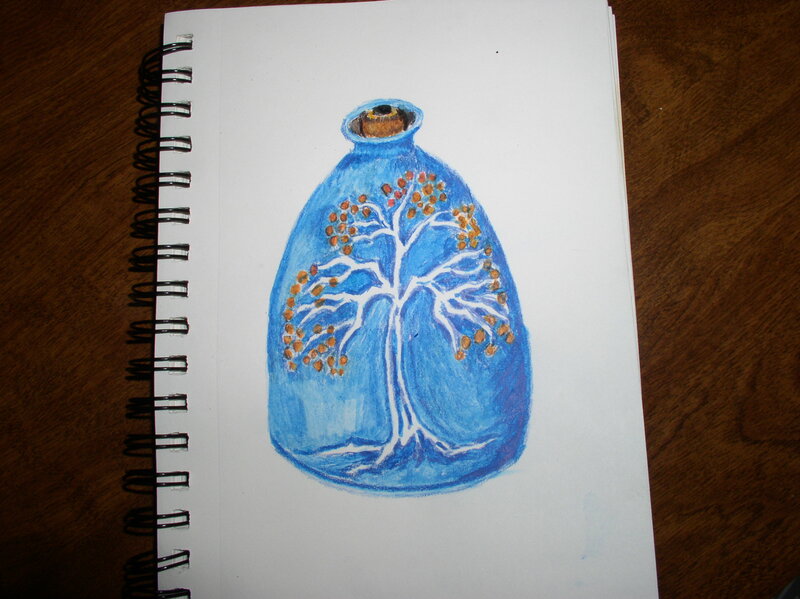 This entry was posted in Uncategorized and tagged creative pursuits, drawing, watercolor pencils on September 1, 2013 by releaf1954.